For the Hamilton Brooke studio, Christmas always comes early. Very early. In fact, we start talking with our clients about their Christmas marketing campaigns while it’s still shorts and t-shirt weather. However, there’s one campaign this year that has really put us in the Christmas spirit – after all, nothing says festive fun quite like a giant gin advent calendar. The Crown Club at The OGH approached us earlier in the year looking for new and inventive ways to promote its incredible variety of gins. Creative, Josephine Ferguson, headed up the project and has worked closely with The Crown Club team to develop its 5-star venue as the artisanal drinks destination of choice. ‘The Crown Club has one of the best selections of premium label gins on the island, we needed to create something that would showcase this in a fun and interesting way for gin enthusiasts,’ said Jo. Firstly, Jo developed The Crown Club Gin Passport – a beautifully crafted guide to the bar’s vast collection of gin which features fantastic imagery and a wonderfully tactile, textured leather finish. 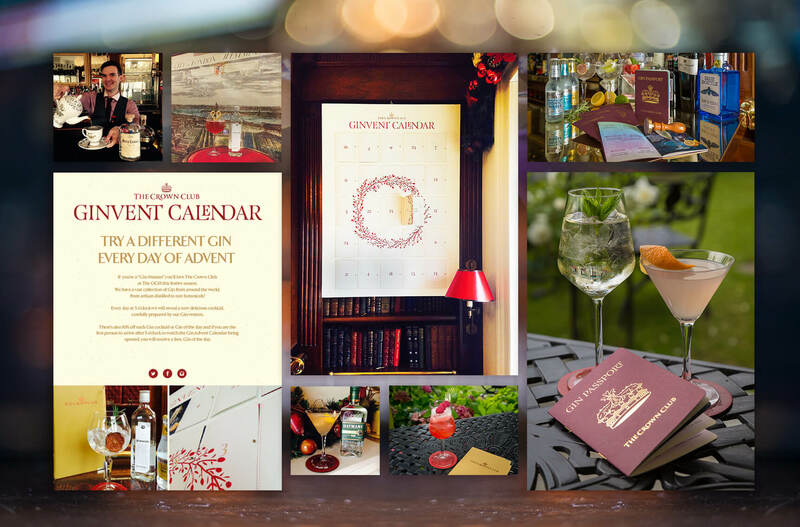 This Christmas saw the launch of The Gin Advent Calendar, a campaign that has been supported by radio, posters and social media, with daily updates, teasers and live streaming events. ‘The calendar provides a fantastic Christmas centrepiece, and was hand finished with miniature brass door handles. Each day there is a tantalising build up of anticipation with the big reveal at 5pm for the gin of the day, we suggested adding the incentive of a free drink to draw in a few new players to the great gin game, so far the promotion is proving wildly popular’. And on that refreshing note, we’re off to sample a few of those rare botanicals – in the name of research, of course.